If other recent Apple announcements weren’t enough to get your head in a spin, Apple has pushed iOS 7.0.3 to iOS devices everywhere. The update adds support for iCloud Keychain and should provide two big fixes: both to the accelerometer calibration issue some users were seeing and recent iMessage bugs. In addition, the update addresses several major complaints with iOS 7 and fixes bugs. For starters, the lock screen will now hold off on displaying “slide to unlock” when Touch ID is in use; Wikipedia and Web search have both been re-added to Spotlight; and the Reduce Motion option in Accessibility now minimizes both animation and motion. On the bug side of the equation, system stability with iWork is improved; an issue with Siri and VoiceOver using lower-quality voices has been addressed; a Lock screen bypass has been patched; and several bugs with VoiceOver, Bold Text, and supervising software have been fixed. 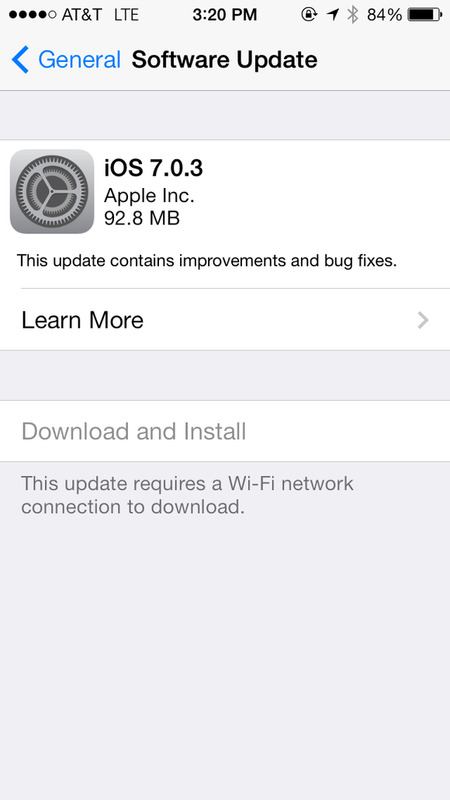 The update is available via the Software Update screen in Settings > General on your iOS device running iOS 7 or later. You can view the update’s security content via Apple’s website.